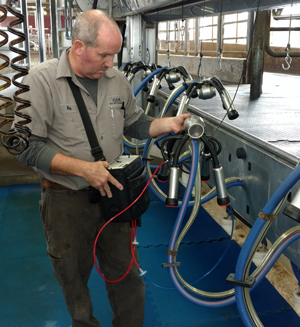 Roy provides service for milking parlor equipment including parlor evaluations with Dr. Carrick including checking system, claw and pulsator vacuum. Maintenance includes rebuilding pulsators and take-off cylinders as well as flushing and servicing vacuum pumps. He also steps in to do many routine maintenance tasks for the vet clinic such as inventory control and some Cattl-Tek supply deliveries.